When I found out about the passing of Colonel Abrams I was quite shocked and shaken. Not only did I realize that one of my most treasured musical hero was gone but I was saddened because of all the struggles he had gone through over the last few years. His legacy is totally impressive. From being into independent soul bands (like 94 East which a certain Prince was also part of) in the seventies to be signed to MCA and having major hits records in the eighties, Colonel and his production team were silent players in introducing a new breed of music. As Disco was fading away from the mainstream, a new form of uptempo R&B was emerging from the NYC / New Jersey area at the same time people from Chicago were experimenting different things. The first two demos of Colonel Abrams became totally essential years after they were made because they had the foundations and all the elements of something that was about to blow out : House music. Made with Boyd Jarvis, these versions of Runnin’ and Release The Tension weren’t released at the time and bootlegs of these recordings became highly expensive. An official re-issue of these tracks has been made available by Echovolt earlier this year. Nevertheless, these demos lead to the release of “Music Is The Answer” on Streetwise and to a record deal with MCA. Colonel then proceeded to have a string of major hits on a worldwide scale for the most part of the eighties. While he was working with Winston Jones and Timmy Regisford amongst others, Colonel Abrams was also writing most of his lyrics and arranging some of his music. Over the years he became a producer working on his own and other singers projects. As the nineties came around, since major labels had no clue what to do with House music acts, the Colonel started to work with different independent labels and he eventually founded his own label. Surprisingly enough, one of his first release from this new era was done with Larry Blackmon of Cameo. Also a few collaborations with Eddie Perez of Smack Music resulted to some of the finest House music around. Beside all these aspects, what made Colonel so legendary was his voice. His vocal delivery was instantly recognizable. He had a unique vocal texture, and a tone that could be either silky or bold while always staying very energetic and powerful. He kept working with pretty much the same backing vocalist for all of his career, creating a somehow rare formula of longevity that crossed the fusion of the eighties sounds through House music for close to 30 years. His lyrics also made him very special. The amount of dramatic love songs he wrote is mesmerizing. He seemed to be the “Luther Vandross” of the underground dance music movement. Sadly, this gives some of us the image that he was a very lonely person. On the flip side, he would write songs about how to overcome certain situations, how to uplift the inner spirit, or about finding unity and peace. His voice was sampled in countless tracks, some getting some major crossover action like Fresh Tunes “Do You Know What I Mean”. Unfortunately, the life of Colonel Abrams became real harsh as of late. He was suffering badly from diabetes, he had major money issues because of his medical treatments, and ended up being homeless at some points. This is a strong reminder to support and cherish our beloved artists while they’re still here with us. 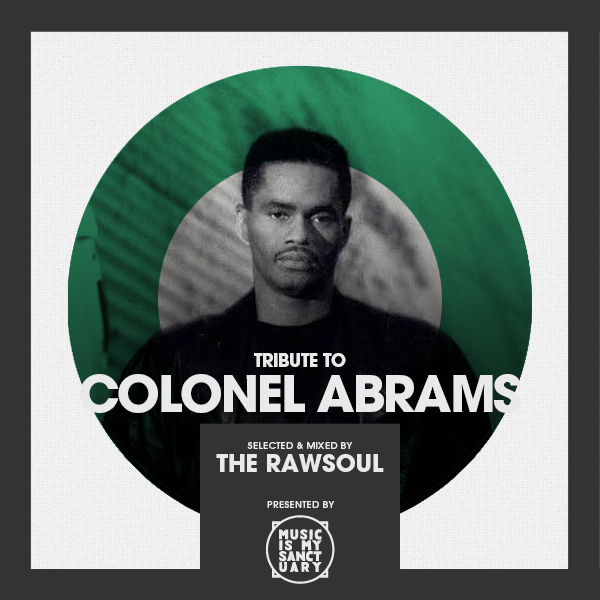 Colonel Abrams died on November 25 at the age of 67, but his musical legacy will live through his special discography consisting of a unique blend of Soul, R&B and House music. 21.Paul Simpson ft Colonel Abrams – Could It Be? Future Classic: Durham University Big Band "Voyage EP"